Hello all! When I say long time no blog, I mean a really long time. Sorry about the delay. Life really got in the way this time. What have I been up to since the last time I was on this site? Well, I took a full-time job. Took care of my daughter. Had a son. You know, the usual. It all left little time for reading or sleeping. Now that he is growing a bit I am trying to catch up on reading . No promises for how often I will be on here, but I do have two great books to blog about. Love family secrets? Hidden letters? Mysteries set against exotic landscapes? Well my friends, this is the book for you. 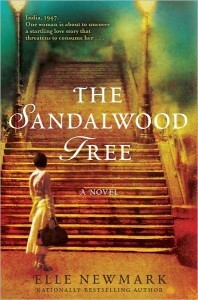 The Sandalwood Tree takes place against the stunning backdrop of India. Evie Mitchell and her young son have followed her husband to Simla, India so that he may document the end of British rule. Evie is hoping that this move will bring her closer with her husband, who has been distant every since World War II. While in India, Evie finds hidden letters in the bungalow that they are renting. Letters that date back 100 years in time between two woman, Felicity and Adela. As unrest and violence sweep the countryside and Evie’s marriage seems to crumble under the weight of her husband’s war secrets, Evie draws herself farther into the past. She takes comfort in the letters that have been uncovered and the mystery surrounding these two women. I loved this book! The beginning was a bit slow, but it was so worth the slow buildin the end. India came to life in this book. I could almost feel the heat and smell the spices. I wanted to know much more about the rich history of the Indian people that Elle Newmark so eloquently puts, “bend but do not break”. I felt for Evie who desperately wanted to reconnect with a husband who was still nursing internal wounds from the war. I longed to sit in Simla and speak to Felicity and Adela, two woman that marched to beat of their own drums in a time where it was unheard of to be different. I am so glad I took a chance on The Sandalwood Tree. I think you should do the same. After you read it, come back here and let me know what you think of India and it’s characters. This entry was posted in Book Club Picks, Uncategorized. Bookmark the permalink.